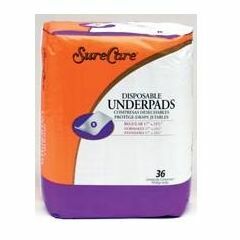 Surecare Disposable Underpads are manufactured with an extra soft and strong white facing to reduce the possibility of skin irritation and a water proof plastic backing to protect your bed linens. Disposable throw away pads for incontinence at Allegro Medical are always available for less. Make you and your patients feel more comfortable with their incontinence issues when you search for disposable incontinence products at Allegro Medical. Find disposable incontinence products at Allegro Medical from the brands you trust when you shop our entire website. We have a number of disposable incontinence medical aids to help you and your patients deal with the effects of incontinence today. For heavy incontinence protection. Protects, beds, chairs and furniture from wetness. Also used as 'doggie' pads and for packing valuables for storage or moving. I use in front of kitty litter box!! My beloved cat is rather messy when using the litter box. I place a pad at the front of the box to protect the floor where kitty usually misses the box and makes a mess. It works great and it has saved me numerous smelly clean ups! Instead of bleaching the floor in front of the litter box twice a day, I just gather up the soiled pad and dispose of it in the trash. My elderly father is incontinent. I use these pads for travel and accidental situations.